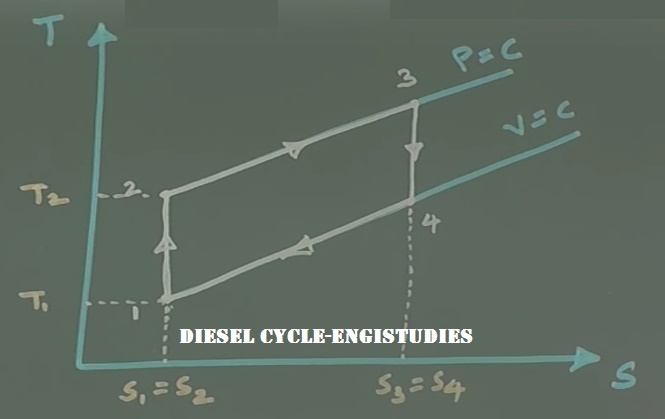 The Diesel cycle is a combustion process of a reciprocating IC engine. It is invented by Rudolph Diesel in the year 1897. It is used in diesel engines. Today in this article we will know about its process in detail with its p-V and T-s diagrams. 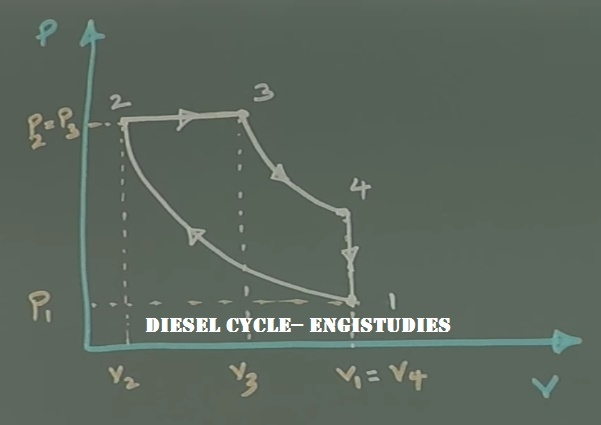 The diesel cycle (combustion process) is similar to the Otto cycle. To understand and learn the cycle fully we should refer its p-V and T-s diagrams. 1–2 is the isentropic compression of air in the cylinder. 2–3 is the constant volume heat addition. 3–4 is the isentropic expansion of air. 4–1 is the constant volume heat rejection. Please refer to Pressure-Volume and Temperature-Entropy diagram below. Other differences are discussed below in the table. Compression ratio is 7:1 to 10:1. Compression ratio 11:1 to 22:1 which is more than Otto. The complete backward stroke of the piston triggers the adiabatic expansion. The adiabatic expansion happens during the rest part of stroke after the heat addition is cut-off in the backward stroke.